Five years ago, Xi Jinping’s path to the Chinese presidency at the 18th Communist party congress was shrouded in political intrigue. With days to go, he disappeared for two weeks. To this day, no one knows why. Yet, as president, Mr Xi has succeeded in a Leninist crusade to reshape and gain control of the party, military and internal security apparatus. With more personal authority than anyone since Mao Zedong, and having transferred power from ministries and technocrats to party officials and committees, he has the opportunity at the 19th party congress, which starts on Wednesday, to consolidate his position and stamp his authority on the government. Normally, the “odd number” congress, marking the first half of a 10-year leadership term, has been of limited interest outside China, except for examining those seen to be in line for succession in five years. This time, though, is different. The congress will be scrutinised for several reasons. With many officials reaching the age of 68 when they step down and several under arrest or investigation for corruption, speculation is rife about the identity of about 200 nominees to the Central Committee that in turn chooses additions to the politburo as well as about the nominees to the Politburo Standing Committee, which may be reduced from seven to five members. The next top leaders may be named, or not, leaving open the possibility that Mr Xi will not step down in 2022. Interest centres on the fate of Premier Li Keqiang, whose economic functions have been mostly usurped, and of Wang Qishan, the 69-year-old, powerful anti-corruption boss and close associate of Mr Xi, who recently met Donald Trump’s former chief strategist Steve Bannon. After the congress, China watchers will try to discern how Mr Xi intends to govern. The concentration of power around the president has undoubtedly increased his authority but it has also reversed much of the institutionalisation of rules and procedures generally regarded as essential to administrative and economic efficiency. Political suppression and censorship, an emphasis on ideology in academia and in companies, and a stalled or diluted reform programme do not inspire confidence that he will suddenly change tack to implement an agenda of liberalisation and openness. The campaign against financial malpractice and excessive risk-taking is likely to continue unless the economy slows abruptly. Excess capacity in old industries such as coal, steel and shipbuilding will probably be closed slowly. Amid tension on the Korean peninsula, China will pursue its path of international engagement via the Belt and Road Initiative, regional trade agreements, the Asian Infrastructure Investment Bank, issues such as climate change, and global health. Decisive issues for China domestically, though, are reforms designed to strengthen productivity growth and avert the feared “middle-income trap”, and real deleveraging that could weaken China’s growth and its currency for some time. Some things, important to economic development, seem very unlikely to change. These include the conflicted role of the party-state as owner, participant and regulator, the absence of the rule of law, and a comprehensive system of land and intellectual property rights and registration. The prominent political role of state enterprises is being strengthened, and the concentration of wealth and assets in the public sector is rising. Other matters seem difficult to embrace. Reform of local government is long overdue and a problem over the next years will be the widening urban-rural divide on income inequality, adequacy of the social safety net, poor paediatric care and high secondary school dropout rates. More immediately, though, the crucial issue is financial policy. The government should shut down the proliferation of local government, public-private, infrastructure and other borrowing vehicles, and allow the bankruptcy of many smaller banks and non-financial banking intermediaries, which have accounted for most of the increase in banking system assets and liabilities since 2008. The main vulnerability is not so much assets or loans but the financial system’s liabilities. Over a third now comprise instruments of very short maturities in the interbank and other wholesale markets, and so-called wealth management products, many of which carry high risks. Before Mr Xi’s second term is up, this funding structure could become as critical for China as it was for the west in 2007. No one knows how China’s deleveraging will proceed. In the next five years Mr Xi could preside over greater financial market and credit discipline, lower economic growth, restructured balance sheets, and eventually more sustainable growth. Or the second term could be much like the first, with alternating struggles focused on growth and debt, but at the risk of a more dramatic financial denouement, while important reform initiatives are left to fester. 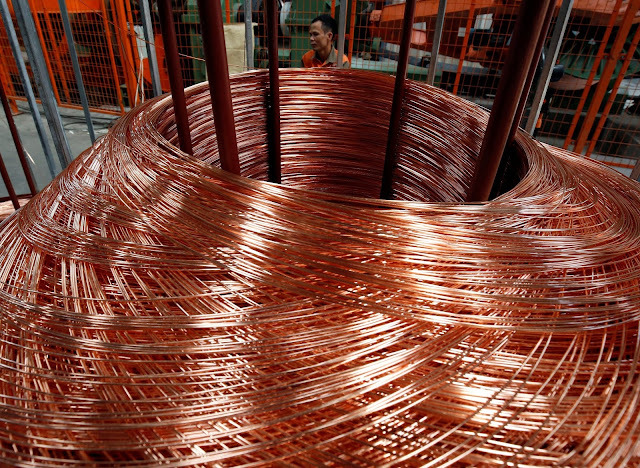 Copper, the metal which Wall Street loves to pretend has a Ph.D. in economics, is these days a close student of Chinese medicine. With that in mind, investors agog at commodities and U.S. equity benchmarks testing new highs should consider the following: Chinese GDP growth just ticked lower for the first time since first-quarter 2016. It wasn’t a big move—data released Thursday showed third-quarter growth edged down to 6.8% from a year earlier, versus 6.9% in the first half. But it does mean that the synchronized growth uptick for the world’s biggest economies is probably nearing an end. Given that, and the enormous weight of China in global copper markets (it consumes about half of global supply every year), it may be difficult for the red metal—often nicknamed Dr. Copper because of the way its fortunes often herald global economic shifts—to keep rocketing higher. It broke through a three-year high this week, briefly heading above $7,000 a metric ton. Other key industrial commodities like coal and steel may also start to lose some of their punch. One reason for skepticism that the commodities rally can maintain momentum is the breakdown of a key correlation in recent months. 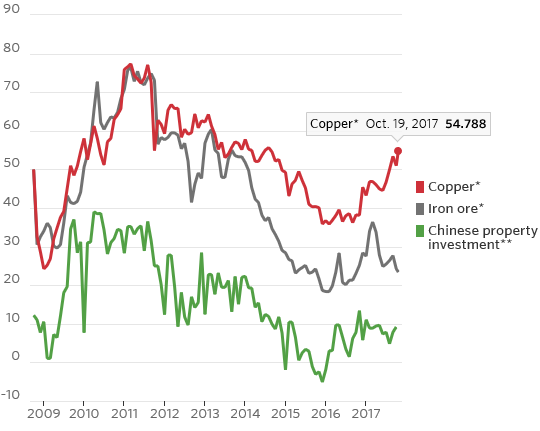 For most of the past decade, copper and iron-ore prices both moved more or less in lockstep with Chinese real-estate investment, the biggest driver of global metals demand. But in 2017, a curious thing has happened: property investment has trended sideways, but copper has gained nearly 30%. Iron ore, meanwhile, is down around 15%. Some of the difference is clearly on the supply side—iron ore arguably suffered the worst of the mining industry’s investment binge in the late 2000s and early 2010s, and will likely remain in substantial oversupply for years. The bullishness in nonferrous metals, and in steel, is also being driven by China’s drive to shut outdated aluminum and steel furnaces, as well as rumors of planned curbs on copper scrap imports. But with Chinese investment growth hitting its lowest level of the new millennium for the second month in a row this September-—and no clear signal on U.S. growth—expecting moderate supply cuts to carry the entire metals complex much higher smacks of wishful thinking. China isn’t collapsing but it’s clearly slowing. Policy signals coming out the nation’s twice-a-decade Communist Party leadership conference are emphasizing political control and deleveraging, not speedy growth. Commodities and U.S. equity investors mesmerized by multiyear highs should cast a careful eye on developments across the Pacific. 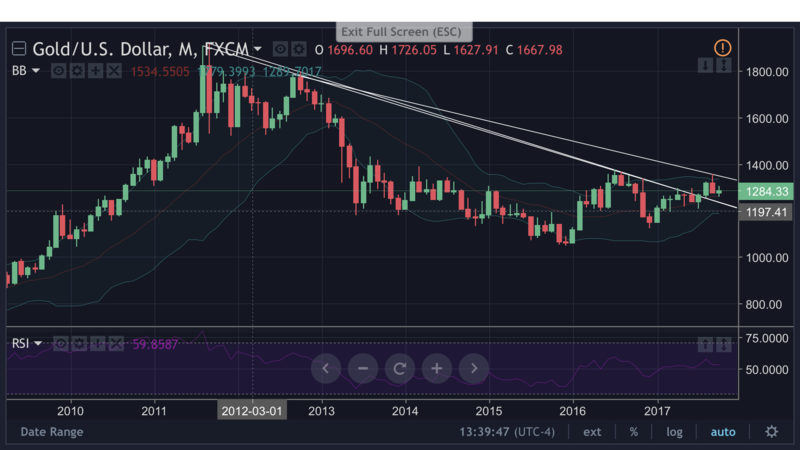 Gold is one of the best performing asset classes of 2017, but it has faced headwinds over the past few weeks based on market expectations that the Fed will raise rates in December. 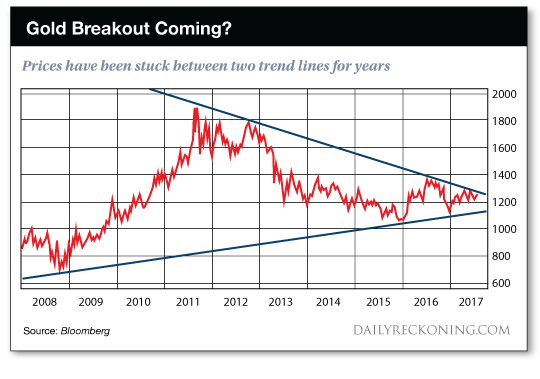 This expectation has caused a set of market movements, including a stronger dollar and weaker gold prices. But as I’ve argued before, my view is that the economy is fundamentally weak and the Fed will not raise rates in December. I base that on nine months of disinflation data (using the Fed’s preferred measure, not alternate measures that market analysts flock to) and on a weakening employment picture including job losses in September for the first time in seven years. Once the market wakes up to the real state of play, probably in late November or early December, the current trends will suddenly reverse. You’ll see the dollar down and gold prices up. That makes the next few weeks an excellent entry point for gold and gold mining stocks. You have a chance to take advantage of weakness and position ahead of the rally to come when the Fed tips its hand. Gold seems poised to resume its march to $1,350 and then $1,400. A flash crash in June was precipitated by the instantaneous sale of gold futures contracts equal in underlying amount to 60 tons of physical gold. 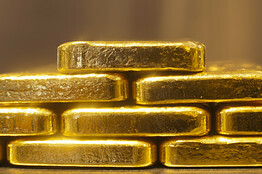 The largest bullion banks in the world could not source 60 tons of physical gold if they had months to do it. The main source of comfort is knowing that fundamentals always win in the long run even if there are temporary reversals. What you need to do is be patient, stay the course and buy strategically when the drawdowns emerge. China may be leading the world back to some form of gold standard by allowing oil exporters to convert the yuan they receive from China into gold on the Shanghai Gold Exchange. The countdown to war with North Korea is underway. A U.S. attack on the North Korean nuclear and missile weapons programs is likely by mid-2018. The stock market may not have noticed, but the gold market has. This partly explains why gold has done as well as it has in the face of all the talk about a December rate hike. And that leads us to with our friends at the Fed. Despite the recent weak inflation data, the market is still pricing in about an 86% chance of a December rate hike. Rate hikes make the dollar stronger and are a head wind for the dollar price of gold. But as I said, the Fed will not hike rates again in December. Once the market wakes up to the reality of a prolonged “pause” by the Fed, they will conclude correctly that the Fed is once again attempting to ease by “forward guidance.” This relative ease will keep the dollar on its downward trend and be a boost to the dollar price of gold. The determining factor is disinflation. The Fed’s target rate for this metric is 2%. It will take a sustained increase over several months for the Fed to conclude that inflation is back on track to meet the Fed’s goal. There’s no chance of this happening before the Fed’s December meeting. Current levels look like the last stop before $1,350 per ounce gold. After that, a price surge is likely as buyers jump on the bandwagon, and then it’s up, up and away. Markets will soon have to come to grips with the realization that the Trump tax cuts as originally envisioned will not materialize. A substantial market correction may be in the cards. Any one of these developments is enough to send gold soaring in response to a panic or as part of a flight to quality. The only force that could take gold lower is deflation, and that is the one thing central banks will never allow. The above chart is one of the most powerful bullish indicators I’ve ever seen. ON OCTOBER 18TH, President Xi Jinping will preside in Beijing over the most important political event in five years. At the Communist Party’s 19th congress much will be made of the triumphs achieved in nearly four decades of reform and opening up. So expect a glossing over of one part of that process where progress has largely stalled: the “internationalisation” of China’s currency, the yuan. This seems odd. Just a year ago, the yuan became the fifth currency in the basket that forms the IMF’s Special Drawing Right (SDR). This marked, in the words of Zhou Xiaochuan, China’s central-bank governor, in a recent interview with Caijing, a financial magazine, “historic progress”. 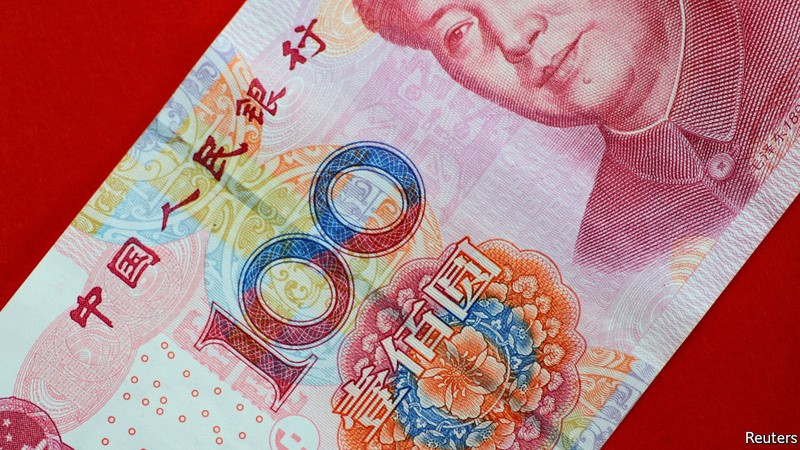 Symbolically, China’s monetary system had been awarded the IMF’s seal of approval. A further boost to prestige was the announcement in June this year that some Chinese shares would be included in two stockmarket benchmarks from MSCI. Yet the yuan’s international reach has in fact fallen in the past two years. It has regained its ranking as the world’s fifth most active for international payments, after slipping to sixth in 2016. But its share of this market has slipped from 2.8% in August 2015 to 1.9% now (see chart). Use of the yuan in global bond markets over this period has fallen by half, as companies have instead raised funds within China. In Hong Kong, the largest offshore market, yuan deposits have plunged by 47% from their peak in December 2014. Of the foreign-exchange reserves held by the world’s governments, just 1.1% are in yuan, compared with 64% for the dollar. The constraints on the internationalisation of the currency are largely self-imposed—and in many cases predated admission to the SDR. A minor devaluation of the yuan in August 2015, intended to make the currency more flexible, was botched. This led to speculation about further falls in the yuan’s value, and forced the central bank to tighten capital controls and spend foreign-exchange reserves to prop it up. Since January this year, China’s reserves have been growing again. But stringent capital controls remain in place. In his interview Mr Zhou called for a renewed drive to free up China’s financial system, citing a “troika” of targets: increased foreign trade and investment; a more market-based exchange rate; and a relaxation of capital controls. He said there was a “time window” for this. If missed, the cost of reform would be higher in the future. Few observers, however, take Mr Zhou’s comments as official policy. In office since 2002, he is expected to be replaced next year. He represents one side of a continuing debate. In September two capital-control rules were indeed eased, but foreign traders tended to share the view of Mitul Kotecha of Barclays, that the move was purely cosmetic. In the words of Eswar Prasad, an economist at Cornell University and author of “Gaining Currency”, a book about the yuan, “what the government giveth, the government can taketh away.” Most foreign investors are all too aware of that. So the currency’s international advance is unlikely to resume soon. More likely is a gradual opening of yuan markets. One avenue is to standardise systems such as the China International Payment System, which processes cross-border payments. Another is to expand the Bond Connect and Stock Connect programmes that link Chinese markets to Hong Kong. A third involves China’s intense diplomatic drive to push its “Belt and Road Initiative”, involving massive investments in infrastructure to boost transport, trade and investment links between China and Central Asia, Europe and Africa. But his apparent belief that measures already taken, such as joining the SDR basket, have set the yuan on a remorseless path towards internationalisation has been contradicted by the experience of the past two years. The party’s watchword remains “stability”. And whatever the benefits of capital-account liberalisation, it would bring a measure of unpredictability. In a battle between openness and control, Mr Xi is likely to favour control.